I’ve been asked by ARAUNY, a local animal rights organization, if I’d like to sell my animal artwork at Greentopia, a big environmental fair downtown in September. The idea of sitting at a craft fair table for an entire weekend makes me want to crawl out of my skin, but I think this would be a good match for me since animal rights motivates so much of my art and I had been trying to think of a promotional outlet for it. I don’t expect a large number of sales, but am hoping I can make some connections and get some exposure and creative ideas. We haven’t ironed out the details, but I figured it couldn’t hurt to get a start on some more works of the subjects I want to highlight at this venue: farm animals. You can see more of them at the “Barnyard” link above. This young cow was rescued and lives at Farm Sanctuary near Watkins Glen. 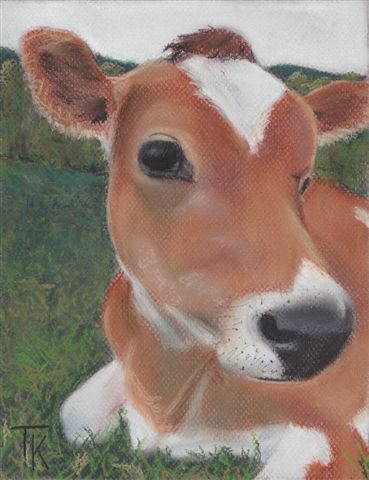 This entry was posted in Business, Making Art, Pastel, Promotion, Vegan and tagged art, cow, pastel, Vegan. Bookmark the permalink.